LASER COMPONENTS and the Fraunhofer Institute for Microelectronic Circuits and Systems IMS have signed a cooperation agreement and will collaborate closely in the future. Especially in the field of LiDAR technologies, both partners promise fresh impetus. Regarding components for the automotive industry, LASER COMPONENTS has made a name for itself primarily with powerful pulsed laser diodes. 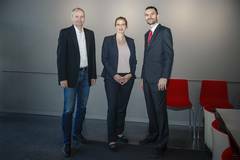 The researchers from Duisburg can contribute new sensor technologies that promise particularly precise measurements.